Another van from the future: This time, a caravan. Looking like a helicopter when face-on, the inside has a little more personality, lacking the white and stainless steel that many modern spaces are made of. Made by IH Leisure in the UK, it is designed to sleep 4, with a range of different layouts to choose from. The Monopod is a one-piece shell, that can be custom-painted to order- why not match it to your car? 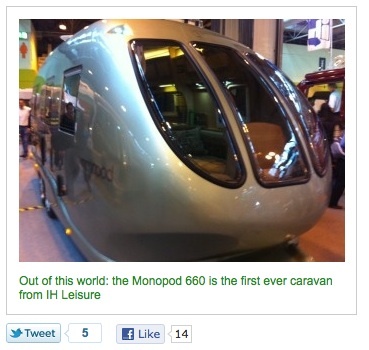 The UK's famous Caravan Club may become more colourful if the Monopod starts a trend! This caravan is top of the line, heated throughout and will cause quite a stir at any holiday park. For UK campervan hire, click here!